In the event of disability, insured members receive a disability pension depending on the degree of disability. Insured members who are at least 25 percent incapacitated are entitled to a disability pension. The degree of disability is defined according to the Federal Disability Insurance. In the case of full disability, the pension amounts to 60% of the insured remunerations at the start of unfitness to work. The retirement savings continue to be accummulated up to age 65. At this point the disability pension is redefined by converting the continued retirement savings into a lifelong pension. How high is the disability-related child pension? If an insured person has children who are below the age of 20 (or 25 if in education) he/she is entitled to a child's pension for each child amounting to 20% of the disability pension received. What happens with the retirement account? The retirement credits on the retirement account continue to be paid by the Pension Fund. This is an additional benefit provided by the risk insurance. Once reached the age of 65, the accumulated retirement savings are converted into a lifelong pension using the conversion rate applicable at that time. What happens in the case of partial disability? 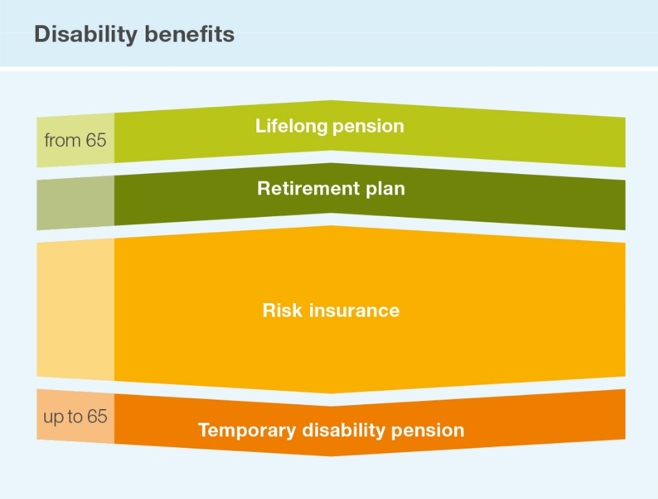 The Pension Fund pays out a full, half or quarter pension depending on the degree of disability. The insured member continues to pay contributions on that part that corresponds to the level of active employment. Degree of disability: The degree of disability is determined on the basis of the incapacitation. The decision of the Federal Disability Insurance is the defining criterion for establishing the degree of disability.